We all want to say we have a high-performance culture. But if you’re relying on any of these bandaids to fix your performance culture, you’re not going to get one. Recently, I had a dream that the top of my left index finger was almost completely cut off. A big disgusting, I know. But what was weird is that I was trying to hold it on with a bandaid. And it wasn’t working. The top of the finger kept falling off. No matter how many bandaids I wrapped around the finger, the fingertip just wouldn’t stay on. Performance systems in organisations are like chopped-off fingertips, too. They need the right kind of attention to get fixed up. Unlike chopped-off fingers, every single organisation has a performance system. Software bandaids: data warehouses, business intelligence, analytics apps, dashboards and scorecards, big data. Method bandaids: brainstorming, SMART, strategy maps, KPI libraries, benchmarking reports, externally imposed regulatory frameworks. Capability bandaids: the cheapest KPI training courses (that don’t teach how), expectations of getting it right first time, paying consultants to do it for you. The bandaids don’t work (no matter how well we post-rationalise our decisions to use them – which humans naturally do so well). Rather, we all need to make a conscious and deliberate decision about the right kind of attention to create a performance culture, and measure and manage performance. Strong evidence-based leadership, because the rest of the organisation follows the leaders’ actions and not their words. It takes time for leaders to embrace and become very practiced at evidence-based leadership. The right skills to measure performance, because it doesn’t come naturally and most people have never experienced it as meaningful and engaging. It takes time to get enough people with the right skills. Dovetailing good measurement practice into strategic planning, review and execution, because these processes are notoriously void of sound measurement guidance. Wrapping bandaids around your organisation’s performance systems is not only futile, but it’s not dignifying for the people trying to make it work. Bandaids like those above erode and weaken the performance culture. They can’t ever strengthen it. 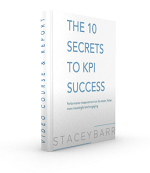 More people stop hiding performance problems to make the KPIs look good. More people get excited about being able to make real performance improvements a reality. Better improvements are implemented, and produce tangible returns like lowering costs, improving customer experiences, and reducing wasted time and effort. More people see the above three things happening, and they want to have the same experience. The ripples radiate outward. A high-performance culture, and the systems that facilitate it, need to build in iterations, that respect the rate at which people can open their minds to new ideas, learn new ways of doing things, practice them to get proficiency, and embed them into their “real work” as new habits. Stop wasting money on bandaids. Do what’s really needed, and do it right. Organisational performance is also a lot more complex than an injured finger. Bandaid approaches don’t work. 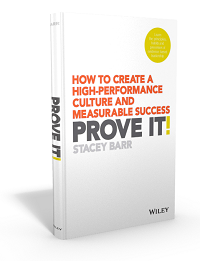 How long has your organisation been trying to create a high-performance culture? Are you there yet? How far have you still to go? Management of organisations, inherently, people is challenging enough to defeat any methodology developed to improve it. Adopting a certain framework or best practice does not solve human problems. Look at GE who are champions of Six Sigma, but could not prevent accounting problems that dug a hole to a tune $15Bn! Leonard, what you say is sad and true. Any methodology that works on an organisation’s operating or management systems cannot ignore the human system. I certainly see PuMP working best and fastest in organisations that engage people around the values of learning and improvement, rather than those that unknowingly disengage people with the values of control and achievement. Yes!!!!! 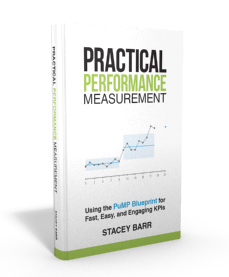 This really came through to me as I read Practical Performance Measurement. That point alone makes me even more vigilant about the precision of words as I help organizations create strategies, plan and measures.. The mushy stuff that passes for strategic direction is often immeasurable and no one wonder strategy is not as FOCUSED as it is intended to be. Bought both books and looking forward to #2 Stacey. Hope you’re well. All the best from snowy Canada. Many leaders speak in “inspirational”, rather than strategic terms. I recently heard a group of leaders speak on the direction a certain department was taking strategically, and I just lost track of the number of weasel words (like Stacey calls them, I call them “fuzzies” which is probably not a real word.). Regardless, those cannot be measured as stated. And to complicate things, it is almost a career-stalling move to ask them what they mean by better, faster, more effective, etc., because most of the time they don’t really know.